Tired of paying monthly fees for subscription streaming apps? AppleInsider shows you what you need to watch TV live on your Apple TV with a digital tuner and an app. When it comes to watching shows on your Apple TV, you've got choices. Streaming apps offer you endless options. Some are free with your cable subscription, like Food Network, HGTV, and Comedy Central. Then there are others that require a subscription of their own such as Hulu or Netflix. If you haven't noticed yet, the common thread amongst all those apps is you need some sort of paid subscription. However, if you have an TV tuner that can stream to your local network (sometimes called an IP tuner), you can actually watch live TV, play/pause/rewind/fast forward live TV, and even record shows. A digital tuner works with several apps including Plex, and Channels. Let's take a more in-depth look at the latter and how you can watch and control live TV on your Apple TV. To start, you need the Channels app on your Apple TV, an IP tuner such as the HD HomeRun, and an antenna. Once you've connected your antenna to your HD HomeRun, and then that into your router, you are all good to go. Simply launch Channels on your Apple TV, and your tuner should be discovered automatically since they are on the same network. The first time you connect the tuner to Channels, it will ask you to scan for available networks. This will find what your antenna is able to receive, and will assign then network names and titles within the Channels app. Within the settings portion of the app, you are also able to choose your favorites, which gives them priority placement on the channel selector. When you go to tune into a show, you've got two options. You can view the "On Now" tab which shows cover art and a title for all of the shows currently airing. Alternatively, you can view the more traditional "Guide" tab to see a grid of all channels, what is on now, and what will be on in the future. While watching a show, Channels gives you to the option to pause for up to 90 minutes. It will highlight a portion of the progress bar in purple to designate the area that has been cached, and you can rewind to any portion of that cached play time. In real use, it means you can pause when you get up to go grab some snacks, then fast forward through the commercials when you return. The advanced Siri remote also has a few tricks. You can click to the left to jump back 7 seconds, maybe to pick up a line you didn't hear. Then you can click to the right to jump forward 30 seconds, perhaps to jump through a commercial. These values can be customized in settings for regular TV, as well as different values specifically for sports. A swipe down from the top while watching brings down your "Favorites Guide" with all your preferred channels, and what is currently airing on them. It also gives you a description of what you are watching, what is coming up next, and when that next show starts. Our favorite little trick is when you shake the remote, it will automatically mute the volume. Aas long as you've got decent bandwidth and solid signal strength, you can stream HD TV that looks as good as any streaming app. It also supports full 5.1 surround sound, multiple languages, closed captions, and VoiceOver. When it comes to advanced options, Channels also supports cloud DVR, though, it will run you $8 per month. It runs locally in your home, so you do need storage, as well as a computer or supported NAS device to run it. Once set up, you can access it at home, or while on the go. If you want to record multiple shows beyond what one tuner allows, you can just add a second (or third) HD HomeRun tuner to your network and Channels will take advantage of all of them. More tuners mean more simultaneous recording. Channels is a fantastic option, but it isn't your only one. There are quite a few additional apps that can support digital tuners, with the most popular being Plex. The past year or so Plex has been building out its live TV functionality to include support for digital tuners, even adding guide and DVR features. If you are already a Plex user, then this may be the option for you. The Apple TV is quite the capable device. We're still impressed with the quality and capabilities you can get with just a tuner and an app when it comes to live TV. Setup is also so dead simple, with installation getting as technical as "plug the tuner into the router", that anyone can handle it. If you want to try this setup for yourself, the HD HomeRun tuner is available on Amazon for roughly $67, and you have quite a few options for antennas. You could pick up a basic antenna for as low as $20 or a Terk one that is stronger for $45. You can download the Channels app from the App Store on your Apple TV for $24.99. What is the advantage of this $200 setup over the OTA antenna to Ant.-In port on the back of the TV? I'd rather feed the antenna cable directly to the TV antenna port and enjoy my OTA broadcast channels. I have wanted to say this somewhere else but here will do. TVOS needs to be licensed. A bit like CarPlay. This will allow TV manufacturers to ship with dual OS'es like cars. Depends on your setup, including if you want DVR, where your TV is located, where your antenna is located, and a bunch of other things. Although we do have a 4K television (w/AppleTV) capable of receiving OTA broadcasts, it's on a roll about easel and often out-of-reach of a coax connection to the large antenna in our attic. We also have two 4K projection theaters (also w/AppleTV), one indoors and one outdoors, and we routinely watch TV on our iPads, iPhones and Macs. Our HDHomeRun tuner and Channels app work beautifully, allowing us to watch OTA broadcasts virtually anywhere in our home. ETA: For those wishing to stream multiple OTA broadcasts over Wi-Fi, I recommend the HDHomeRun Extend, which contains hardware H.264 compression. How are sports fans deal able to follow their favorite teams? I would love to ditch my cable subscription, but we are also hockey fans, and there seems to be no decent way of watching the games except through cable (or Direct TV, which has its own issues). The NHL app (with a paid subscription) blocks out local games. Stupidly, the NHL thinks that LA and Anaheim are "local" even though we live 300+ miles away in Silicon Valley. Its a nice solution. In my case I took bell ALT TV for $15 / month which gives me more channels then what I can received OTA. They have a native apple TV app. I cant PVR but I have access to on demand content. Since most shows are availble on demand (last 3 or 4 episodes) , its kind of like having a PVR. I mostly watch Netflix and CraveTV now anyway. You are perfectly free to do that!!! I have my Antenna directly connected to my TV's as a BACKUP. The problem is you can't time shift and you can't skip past commercials. This is where some type of DVR solution comes in. When I cut the cord a number of years ago, I started using Windows Media Center as my DVR solution. When I got my house, I have more TV's and so used Xbox 360's as Media Extenders. Microsoft dropped Media Center for Windows 10, so I ended up going with TIVO. I had TIVO a really long time ago, back in 1999 when it first came out. I had stopped using it later when I moved to cable TV and their Box and DVR solution. Anyway I now have a Tivo Roamio in my Family room, and Tivo Mini's in the Bedroom. So it works the same as Media Center setup I had. I do have a NAS, and I run PLEX on that. I pulled back out my HD Homerun tuners once again that I had used for Media Center, and now PLEX is using them. I don't use them much. Mainly backup because I already have the TIVO's. There are some limitations with PLEX over TIVO. But as the software gets better in that area, that will improve. There is also another one similar to Plex called EMBY. I've been playing around with that also. They each have their Pros and Cons. PLEX is much more well known, but EMBY also has a app for iOS and for the Apple TV. That's the thing using something like PLEX or EMBY. You can record to them as a DVR. They have channel guide listings and so forth. you normally have NONE of that when going directly into the TV. Who wants to watch shows at the day and time they actually air on tv? I don't, and havn't done that in a very long time. No need to channel surf during commercials. I cvan skip past them all. In fact on Tivo, there's Commerial Skip. So a number of channels in Prime time, once the show is over you can then watch and when the commerials come on, hit the green button and skip past them all and continue on witht he show. So I got my Tivo Roamio for $299 which is a 4 tuner box. So I can record 4 programs at once and watch something already recorded. it has lifetime service, so no monthly fee's. I got that while on sale. Using PLEX or EMBY is like having your own personal Netflix type service. If you record your TV using them or put your Media up like you're Movies and Music and other things, you can watch all that content no matter where in the world you are, so long as you have a Internet connection. So you record a TV program with PLEX and maybe want to watch it on your iPad in the back yard. You could do that. I like my ATV4. I needed to replace a failed HDTV, and I got a good deal on a Roku 4k smart TV. The only thing I now use the ATV for now is playing movies from my iTunes library (and that isn't often.) Roku 8 came with a channel guide for OTA TV. The TV even has a rudimentary "go back" function with a USB stick for OTA content. It isn't actually a DVR, but if you miss the big play, you can go back. Pretty slick. I'm a big Apple proponent, but the Roku remote is far superior *for my needs* than the ATV Siri remote. The latter is a big...meh. You can use the channel streaming over your router to other devices in the house, such as your iPad in bed. I just want a hard drive and a competently designed UI that I can use as a DVR to record OTA broadcast TV with ZERO need for WiFi or Internet connectivity. What is the advantage of this $200 setup vs Ant-in and television tuner? Some advantages: 1) You can time shift. Even without the DVR you can pause, fast forward and rewind television. 2) You don't need to split your antenna and run coax to every television. Your AppleTV can be wireless, so you can get by without running any wires to a television. 3) Channels also has an iOS app so you can use the same HD Homerun and antenna to watch television on your iphone and ipad. 4) In my opinion Channels offers a better television interface then most smart TVs. 5) Channels offers the same interface across television manufacturers. Nice feature for the less technical friends and family members. The Channels DVR brings additional advantages but I'll stop here for now. To one each own. It may not worth it for me for some broadcasted local channels, and also I already had coaxial cables connected to every room with antenna splitter built in with the house. So, every TV in my house can just connect to the antenna port on the wall and we're good to go. When I built my new home, I knew I wouldn't want coax running through the house. But I did want cat6. So, I ran a coax line from the attic to the basement, hooked up an HDHomerun down there, and then piped it into my network. It does work over wifi, but I have better results over cat6. 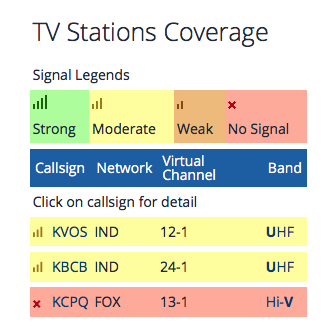 For most regions, an internet connection is needed to get channel lineup information & airing schedules, as PSIP data is not always included in the ATSC broadcast. SiliconDust's utilities allow manual recordings based on tim, and would not need to be connected to the internet, but you would basically be guessing what you were recording, and have no data on shows you were recording. DVR & better (more complete) guide data. How is it that there is no Apple TV app version of HDHomeRun?! This is key!!! As soon as there is an ATSC 3.0 version of HDHR w/ATV app, I am game. I used VLC until Channels development got far enough along that i thought a one-time $25 cost was worth it. While free apps are great, there are some that are worth paying for. I have a cheap set-top box that converts the OTA digital HDTV broadcast signal into a usable format for an older (non-HDTV) television. This cheap box receives program information over the air also... no Internet is needed for schedule info. That schedule information was available to me years ago over the air when it was used by a “VCR+“ (VCR Plus) system to record scheduled shows. There is absolutely no reason an Internet connection should be required to solve this problem. This is a nice discussion as long as you are near OTA transmission stations. I used https://www.fcc.gov/media/engineering/dtvmaps to check my coverage and I don't have any. An antenna wasn't mentioned until the second line of Getting Started. I was hoping this was a discussion on being able to go directly to the broadcast companies over the internet, bypassing everything else. No such luck. My only options are Comcast or satellite along with an assortment of equally expensive subscriptions.